By 1936 the Hancock family were back in the United Kingdom and living at 110 Sloane Street in London’s fashionable Kensington, as well as owning a country house at Lingfield, in Surrey. Ralph had purchased the derelict 16th century farmhouse (Gate House Farm) which was in a dilapidated state and set about restoring the property to its former glory. He travelled the country finding suitable oak timbers and stone to turn what had been a simple farm house into a mock-Tudor home fit for a successful landscape architect. As well as refurbishing the family home, Ralph also designed and built one of his trademark gardens using many of the features that have become familiar including; a herringbone brick paths, a sunken garden, a rockery and even a Tudor style summer house. Ralph and his family took well to the country life. The image above left was taken sometime in the early 1940's. It shows Ralph, Muriel, Sheila, Bramley's wife Susie and their daughter Angela. Bramley himself was in the army and was either already in France or about to embark. Sheila remembered that Denys was installed in a ramshackle extension to the main house and, by her account, enjoyed living there immensley. Ralph immersed himself totally in country living. One day he decided that he would keep pigs and, although he employed someone to look after them, he even purchased a pig keeper’s white coat, much to the amusement of the family. Sadly, the family house at Lingfield was sold by Ralph in 1941 and the family moved back to Sloane Street, London. The two images below show the Hancock family home as it was when Ralph and his family knew it circa 1938 and again in 2007. The later image clearly shows Ralph's trademark herringbone brick path, sadly, at the time, in need of attention. The planting too looks much as it did 70 years before, albeit now very mature. The rear garden still has many of Ralph's trademark features, including the mock-Tudor summer house. Sadly the sunken garden has disappeared overtime. Left, circa 1940. Right, 2007. In early May 2015, The new owners of Gate House Farm contacted this website with some exciting news about the restoration of the house and of the garden. They explained that the previous owner had undertaken extensive research into the history of Gate House Farm. It transpires that the first owner of the property was John Shaw and the place was originally called Shawlands Farm. Shaw died in 1529 and so the house is likely to predate his death. The current owners further explained that during a recent visit by the Surrey Heritage inspector, it was discovered that the house had a "dragon beam" in the main lounge – an incredible find as there are only 10 properties in Surrey with them. Seven of which are cottages located next to the nearby Lingfield church. These properties are dated 1475 and so it is quite likely that Gate House Farm was built around the same time? The Heritage inspector also noted that, despite outward appearances, the apparent Tudor look to the house was all fake and was actually hiding solid brick walls behind the plaster work. When Hancock purchased the property it was in an incredibly dilapidated state. As he installed the mock-Tudor summer house and the Tudor-style herringbone brick pathways, it is very likely that Ralph also installed the walls to the front and side of the house. After all, Hancock was establishing himself as a country gentleman and what better than to reside in a Tudor property, even if in reality, it was not! Ralph sold the property in 1941 to a Mrs Hamilton. She was reputed to be famous for her parties around the properties swimming pool. It is unlikely Ralph installed the pool as his daughter, Sheila, has no recollection of it. The current owners of the property have just undertaken a total restoration of the overgrown and leaking rockery. Taking it back to its original look when built in the late 1930's. They have also discovered a mock-Tudor duck house on the huge pond next to Gate House Farm. Another likely Hancock embellishment? Hancock's daughter has recollections of this pond and of herself lazily drifting on it in a small rowing boat. Current plans as of May 2015, are to reinstate the lost sunken garden. The owners hope to be able to do this with the aid of a home-made film dating to the 1970’s which a previous owner had made. They are also hoping to locate images of the gardens taken between 1940 and 1970. This ambitious project will finally bring back to life what Ralph so painstakingly created. Ralph installed it during his tenure at Gate House Farm. Gate House Farm, May 2015. After a total restoration the house is looking impressive to say the least. The rear/side garden. The dark patch in the middle of the image is where the lost sunken garden would have been. The right hand image, one of the restored rooms within the house, shows a Tudor-style fireplace. The arch is incredibly similar to the Tudor arches which Ralph used so impressively at the Rockefeller Center, Derry and Toms and at the Chelsea Flower Show. Was this fireplace his inspiration? Shorty after his return from the United States in early 1936, Ralph was to appear at Highgate Magistrates Court on a charge of speeding. On December 21st 1935 he had been recoded by the Metropolitan Police as driving at a speed of between 38 and 40 miles per hour on Ballards Lane, Finchley, London. According to a newspaper report from the Times and Guardian of 31st January 1936, whilst the hapless Ralph awaited his turn before the Bench, another defendant was being heard on a charge of begging (gathering alms) on Church Road, Highgate, London. Listening to his plight Ralph spoke up and offered the fellow, who like Ralph was a native of Cardiff, a job at Whetstone. The defendant accepted the vacancy. Later, when Ralph was summoned he explained that he had lived abroad for the previous six years and that the importance of the new speed law had not dawned on him. The Chairman of the Bench (Mr F Kershaw) responded: In view of what you did earlier I am sorry that we can't over look it (the offence). To which Ralph replied: I would not ask you to do so, sir! He was fined 20 shillings (£1) but his licence was not endorsed. The Portsmouth Evening News, 6 February 1936, carried an interview with Ralph regarding the redevelopment of the abandoned Lumps Fort in Southsea, Hampshire. This derelict military established had been earmarked by the City Corporation as a memorial garden to King George V who had died in January. The article quoted Ralph at length regarding his plans for a Garden of the World. "Here is a chance" he said "for Southsea to become famous all over the world for its international gardens embodying the charecteristics and breathing the atmosphere of all the big nations. So authentic could these gardens be made that the people of other nations would travel a long way to see them." Ralph's plans included gardens representing Italy, Japan, Spain, France, Canada, Holland, the USA, Germany, Sweden, Mexico and China. As well as a modern layout and a bird sanctuary. All within the four acre site that was currently occupied by the derelict fort. Hancock went on to say that the Ambassadors of the nations whose gardens were represented could be invited to open their respective garden. Coats of arms would be installed on the walls and at night they could be floodlit. Visitors would be charged 6d a visit with season tickets and free days being made available to local residents. Special tickets for school children could also be made available as the gardens would have a distinct educational value to them. The article was accompanied by a number of photographs of the Gardens of the Nations in New York as way of illustrating how Lumps Fort may look. The redevelopment of the fort were interrupted by the outbreak of war. It was used as a base for Special Forces, the famous "Cockleshell Heroes", during their raids on shipping in Bordeaux Harbour. After the war part of the site was planted as a rose garden and another part became the Southsea Model Village. It is unknown whether either attraction bring people of other nations to see them? Left, the Rose Gardens shortly after their opening. Ralph continued to be a very successful exhibitor at the Chelsea Flower Show, winning gold medals in 1936, ’37 and ’38. The gardens constructed at Chelsea had moved away from the naturalistic rock garden style towards the arts and crafts style that is now more associated with his later work. One of Ralph's specialities became the use of Moon Gates, which he used both at Chelsea and a number of other garden projects. The Times newspaper reported on 27 May 1937; "A very clever reproduction of a formal Tudor garden on traditional lines has been arranged by Mr Ralph Hancock. The main feature is an octagonal courtyard surrounded by old brick walls, with openings filled by wrought iron panels, and containing an old pump. A brick and stone walkway leads through a series of vine-clad archways towards an oak door, in front of which stand a sundial." The image right, taken from the Illustrated London News (May 1938) shows the lengths to which Ralph went in recreating a slice of olde England. He would use similar structures at other Flower shows, adapting each structure to suit the particular theme. 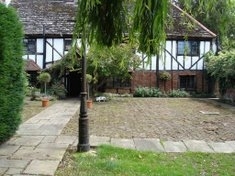 Ralph would travel the country looking for suitable old oak timbers and stone that he could incorporate in his designs. His daughter, Sheila also recalls her father riding horseback across Yorkshire in search of rocks that he would later utilise in numerous projects. As well as designing gardens, Hancock (1936) also wrote and published a book entitled When I Make a Garden, which was reprinted in 1950 and updated to include images of the Derry and Toms roof gardens as well as his later work. He also exhibited gardens at the Ideal Home Exhibition in 1936, ’37 and ’38. Each of the Ideal Homes gardens was required to conform to a theme. In 1936 the theme was Gardens and Music. The garden was to feature 1,200 plants that were brought over from the USA. The 1937 theme was Gardens of the Lovers for which Ralph took as his inspiration Kenilworth Castle in Warwickshire. The image left is taken from a postcard sold at the show. The theme for the 1938 show was Novelist and their Gardens for which the designers had to take as inspiration their favourite living author. Ralph chose as his inspiration Rafael Sabatini. Sabatini was famous for his tales of high adventure such as Scaramouche, Captain Blood and The Sea Hawk, all of which became successful motion pictures. Captain Blood was produced in 1935 and gave a young Errol Flynn his first ever Hollywood starring role. The show catalogue for that year hints at some form of collaboration between the author and the architect. Although of Italian birth Sabatini was living in Hereford, England. Ralph’s garden tribute to Sabatini featured a half-timbered cottage (seen here on the right) and also his trademark herringbone brickwork. The planting consisted of rhododendrons, heathers and aquatic plants near a winding brook. A year later in 1939 Ralph won a silver cup at the Chelsea Flower Show for a Formal Mediterranean Garden. The garden was to feature many of the structures which Ralph had used successfully at both the Derry Gardens in London and within the Spanish garden on the 11th floor of the Rockefeller Center in New York. As well as exhibiting at Chelsea and the Ideal Home Exhibition, Ralph never missed a chance to promote his thriving business. In November 1938, he took the opportunity to display his Hollywood Gardens at the fledgling Woman's Fair, held at London's Olympia. Reported in the Evening Telegraph on 15 October 1938, Hancock is quoted as saying that these were the "finest indoor gardens ever seen." The article entitled The Plant That Must Keep on Walking gives a fascinating insight as to what visitors to the show would have seen. Twenty foot tall palm trees and pineapples in fruit. Creeping Devil, Golden Barrel and Old Man cacti nestled against the walls of ten Spanish-style Californian homes. One built to resemble the home of child star, Shirley Temple. The image, right, is taken from the 1950 edition of "When I Make a Garden". Although untitled in the book, the image is that of the Hollywood Gardens shown at the Woman's Fair in 1938. The description given certainly seems to reflect the planting and Spanish-style homes as suggested within the Evening Telegraph article. The 21 March 1941 edition of the Surrey Mirror and County Post carried a detailed article about Ralph's misfortune and apparent history of bankruptcy. Ralph had appeared at the Croydon Bankruptcy Court on Thursday 18 March, after recieving an order against him from a creditor the previous November to the value of £333. This being for rent and dilapidation liabilities. Presumably linked to Gate House Farm? Ralph explained that he had liabilites of £5451 with assets of £188. Ralph also admitted that he had previously been made a bankrupt at the Cardiff Bankruptcy Court in 1921 having liabilites of £2253 and assets of just £8. He went on to explain that he had paid the debt in full by 1930 before moving to New York in June of the same year. He added that once in New York, he was engaged to install gardens at the Rockefeller Center. He also rented space too! Ralph said that, at first, the venture went well. But very soon it went bad and takings went down to zero. He had also borrowed £2000 from a business partner and before he left the United States an order was obtained against Ralph for £2116. He returned to England in 1936 and set up Ralph Hancock Ltd. He said that at times the business (landscape architecture) had been substantial but it also suffered from long periods, for the last two or three years, of nothing at all. He continued that in 1939 he had set up British Air Raid Shelters Ltd., Ralph admitted that the business venture failed as he knew nothing about building such shelters. Ralph told the court that since the outbreak of war the business had ceased completely and the only work he had was to finish contracts already in hand. He said that he had been unemployed between February and June 1940 and then he was called up for military service. He attributed his current financial crisis solely as a result of the hostilities. The Registrar, Captain Bruce Humfrey, adjourned the examination of costings to a court in the north of England to suit the debtors convenience. By 1941, Ralph, Denys and Bramley were all serving in the military. Muriel volunteered and drove ambulances during the London Blitz. Ralph, who had previously served as a Second Lieutenant in the Great War with the Welsh Brigade of the Royal Field Artillery, was re-activated on 3 July 1940. He was promoted to the rank of Honorary Captain with the Pioneer Corps. Second Lieutenant Denys Hancock, who was to tragically lose his life on 20 November 1941 at the battle of Sidi Rezegh in North Africa, joined the Royal Tank Regiment. Captain Bramley Hancock, seen here in May 1944 (far left, bottom row) served as a Forward Observation Officer with the 94th Field Regiment of the Royal Artillery. He suffered wounds during action against the German Army in July 1944. Later, in November of that year he was to see acton again. This time during the battle for Suggerath, Germany. It was during this battle that he was award the Distinguished Service Cross by the President of The United States. The medal is second only to the Medal of Honor. Sheila, who was only 11 when war was declared, was sent to neutral America to stay with family friends. She left Liverpool, aboard the "SS Scythia", on 25 June 1940. Denys along with over 2600 other casualties is buried at Knightsbridge War Cemetery, Acroma, Libya. Please follow this link to a detailed record of the entry for Denys Hallen Hancock at the CWGC website. Back home in England, Derry and Toms was damaged during an enemy air-raid. Postcards printed at the time show a 500 pound landmine in the Spanish garden which had failed to explode. After the war ended the damage caused to the gardens was repaired. Although the garden was restored to it’s pre-war splendour neither Ralph nor Muriel fully recovered from the death of their youngest son, Denys. The image left has been kindly supplied by the Commonwealth War Graves Commission.